Where does my most valuable data reside?What would cause the worst reputation impact to my business? Will you collect logs from my most critical systems/applications? (This includes systems and applications outside of the traditional network, e.g. cloud services)Can you analyze endpoint events from my critical systems?Are you able to monitor if an attacker impersonates as one of my employees?Can you centralize and analyze events from my existing security technology?Can you demonstrate how you detect malicious tools, tactics, and procedures across the entire attack lifecycle? Traditional threat intelligence: Using this methodology, IP addresses, domains, and file hashes are matched against Rapid7’s threat intelligence curated by Rebekah Brown and the Threat Intelligence Team, Mike Scutt and the MDR SOC analysts, Tim Stiller and the Incident Response Team, and the various projects from the Rapid7 Labs team including Project Sonarand Project Heisenberg. Additionally, we are proud, good standing members and on the board of directors for the Cyber Threat Alliance and have established public, commercial, and private partnerships for intelligence sharing. This enables Rapid7 MDR to detect and validate common threats across the traditional and modern enterprise network.Attacker Behavior Analytics (ABA): Complementing MDR’s ability to detect known tools and threats, our analysts and researchers also strive to detect behaviors associated with attacks and attackers. Our premise is that the tools change often, but the behaviors largely remain the same. During threat validation and incident response, analysts research the events and evidence leading up to the threat or discovered breach. Our SOC analysts and threat intel teams then create detections that look for specific events and evidence that match these specific behaviors. 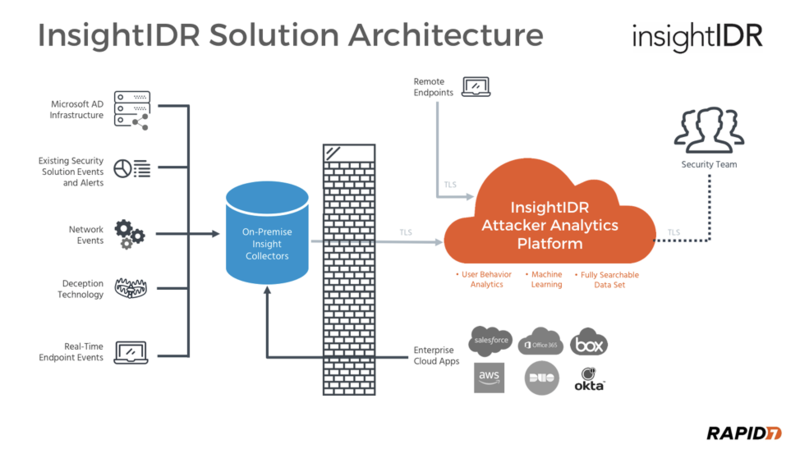 This partnership between our SOCs and InsightIDR engineering teams has led to a data collection and analysis engine that is specifically built for attacker behavior detection. Using this methodology, Rapid7 MDR detects 0-day common threats, targeted threats in all stages of the attack lifecycle, and certain insider threats across the traditional and modern network enterprise network. Learn more about Rapid7’s attacker behavior analytics.User Behavior Analytics (UBA): According to the 2018 Verizon DBIR, the use of stolen credentials and phishing are the first and third most common actions behind confirmed breaches (RAM scrapers came in number two). Understanding typical user behavior and asset relationships is critical when detecting threats in the reconnaissance, lateral movement, and persistence phases of the attack lifecycle. Rapid7’s InsightIDR has the leading user behavior analytics engine to establish a healthy baseline and alert on signs indicative of compromise. Using this methodology, Rapid7 MDR detects destructive common malware (such as worms and crypto-malware), targeted attacks in specific phases of the attack lifecycle, and most insider threats.Monthly threat hunts: This is the safety net methodology. On a monthly basis, MDR SOC analysts perform a human driven, in-depth threat hunt across forensics artifacts generated from the traditional and modern enterprise network. The visibility provided by the data collection abilities of InsightIDR, data analysis techniques such as frequency analysis, and a purpose-built threat hunting user interface give the MDR SOC analysts the ability to hunt for threats that may have evaded our other three detection methodologies. Using this methodology, Rapid7 MDR detects 0-day common threats, targeted threats at all stages of the attack lifecycle, and identifies potential avenues for insider threats to steal and exfiltrate your data.